Generative Wardrobe by designer Alex Dodge is a concept study that explores various wearable technologies to form a complete system from head to the toes. Starting with a highly futuristic head cap called ‘Sleep Talker‘ envisioned to allow the broadcasting of one’s unconscious experience = dreams on social networks. Facebook with a dream status update – how does this sound? Haptic-Synth is an undergarment type of thin shirt embedded with with an array of Haptic-Synth ‘cells’. Each cell contains a compression touch sensor coupled with a miniature haptic feedback actuator. The Haptic-Synth shirt acts as gesture based input and feedback device for the complete wearable technology system. A light, cross-seasonal jacket called Wearable Interface explores the possibilities of embedding mobile technologies in a ardent serving as CPU for future wearable technology systems. The jacket’s on-board processor with connections to USB ports, GPS, accelerometers, microphones, temperature or photo sensors, can be trained and programmed to interact with a range of other devices. 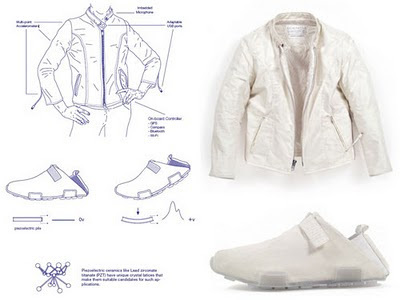 Last but not least interesting is the Powerstep, a pair of nicely design shoes converting mechanical energy via piezoelectric ceramic components inside the sole into electric current with each step.